Dr. Hyla Cass is one of the country's foremost authors and speakers on the subject of integrative medicine. A former Assistant Clinical Professor of Psychiatry at UCLA School of Medicine, she has incorporated nutrition and natural health techniques into her practice for more than 20 years. As a nationally recognized natural health expert and author, Dr. Cass has shared her many clinical successes in her best-selling books (8 Weeks to Vibrant Health, Supplement Your Prescription, Natural Highs: Supplements, Nutrition, and Mind-Body Techniques to Feel Good All the Time, A User's Guide to Herbal Remedies, etc.). In her latest book, in "8 Weeks to Vibrant Health" Dr. Cass and health writer Kathleen Barnes address ways women can empower themselves. 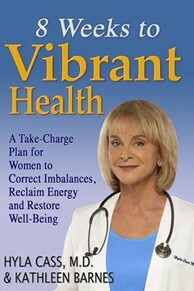 Designed as a guide to help women achieve optimum health, "8 Weeks to Vibrant Health" offers a practical, eight-week program to help women discover the underlying causes of health problems, as well as presenting safe and effective approaches that combine conventional, alternative, integrative, and natural medicine to restore body balance, reclaim energy, and restore well-being. Nationally acclaimed innovator and expert in the fields of integrative medicine, psychiatry, and addiction recovery, Dr. Cass helps individuals to take charge of their health. One area is in withdrawing from both psychiatric medication and substances of abuse with the aid of natural supplements. Dr. Cass appears often as a guest on national radio and television, including The Dr. Oz Show, E! Entertainment, and The View, and in national print media. She has been quoted in many national magazines, blogs for the Huffington Post, and is the author of several best-selling books including: Natural Highs, 8 Weeks to Vibrant Health, Supplement your Prescription: What Your Doctor Doesn't Know About Nutrition, and her ebook, The Addicted Brain and How to Break Free. She has created her own line of innovative nutritional supplements. A member of the Medical Advisory Board of the Health Sciences Institute and Taste for Life Magazine, she is also Associate Editor of Total Health Magazine, she has served on the boards of California Citizens for Health and the American College for Advancement in Medicine (ACAM). A native of Toronto, she graduated from the University of Toronto School of Medicine, interned at Los Angeles County-USC Medical Center, and completed a psychiatric residency at Cedars-Sinai Medical Center/UCLA. She is a Diplomate of the American Board of Psychiatry and Neurology (ABPN), and of the American Board of Integrative Holistic Medicine (ABIHM). Treat the whole person – mind, body, spirit, and environment. Determine the deepest root causes of symptoms, using scientific lab testing if needed. Apply a continuum of treatments, always beginning with the safest and most nautural as possible. In this way, we have the opportunity to help heal our health care system, our communities, our planet, and ultimately, ourselves. Dr. Cass is also a member of the Advisory Board of Health Sciences Institute, Taste for Life Magazine, and Total Health Magazine, and an advisory board member of California Citizens for Health. She consults to the supplement industry regarding formulations, and has developed several under her own label. Incorporating nutritional principles and natural health techniques in her practice for more than 25 years, Dr. Cass is one of the nation's foremost authors and speakers on the subject of integrative medicine. She regularly appears on radio and television, including The View, The CBS Evening News and MSNBC, where she successfully debated a "Quackbuster" challenger. Dr. Cass is quoted as an expert in the field in publications such as the Los Angeles Times, The Toronto Star, Cosmopolitan, Time Magazine, and People Magazine. Her speaking topics to both lay and professional medical audiences include complementary medicine and psychiatry, anti-aging, women's health (including bio-identical hormone therapy), stress reduction, and natural treatments for addictions, anxiety disorders, and depression. Dr Cass also maintains a busy schedule of speaking engagements at health-related events around the country, with topics ranging from complementary medicine and psychiatry, anti-aging, women's health (including natural hormone therapy), weight management, to stress reduction, and natural treatments for addictions, anxiety disorders, and depression. Media: Click here for media and speaking resources. Dr. Cass has a private practice in Pacific Palisades, CA (near Santa Monica, in the Los Angeles area). She uses an integrated approach in her evaluation and treatment of individuals with a wide variety of problems. Practice: Click here for consultation information.